Samson has spent over 35 years creating high-value, innovative audio products for both professional and consumer markets in live, studio and business environments. 11 years ago Samson developed the world’s first Professional USB Microphone, the C01U, providing multimedia creators an instant upgrade to computer audio quality and convenience. Andrea Electronics worked closely with Samson to develop the new Go Mic Connect, the most advanced USB stereo array microphone in the market (see chart below). From acoustic and hardware design consulting, to creating the complete software suite to empower this new type of Microphone, Andrea continues to work with customers and partners to advance the stare-of-the-art of digital microphones. As cloud based digital assistant applications like Google Now and Microsoft’s Windows10 Cortana become increasingly popular, Andrea’s microphone technology is ideal for enabling the natural language user interface for computers and the Internet of Things (IoT). The stereo array microphone’s digital beam forming enhances the pickup patterns directionality to better target the voice directly in front of the microphone. When activated, all sound that originates outside the focus area is significantly reduced, making the Go Mic Connect ideal for noisy environment communications. The second digital noise reduction algorithm improves speech articulation by reducing ambient noise in the environment such as computer fans and air conditioners. 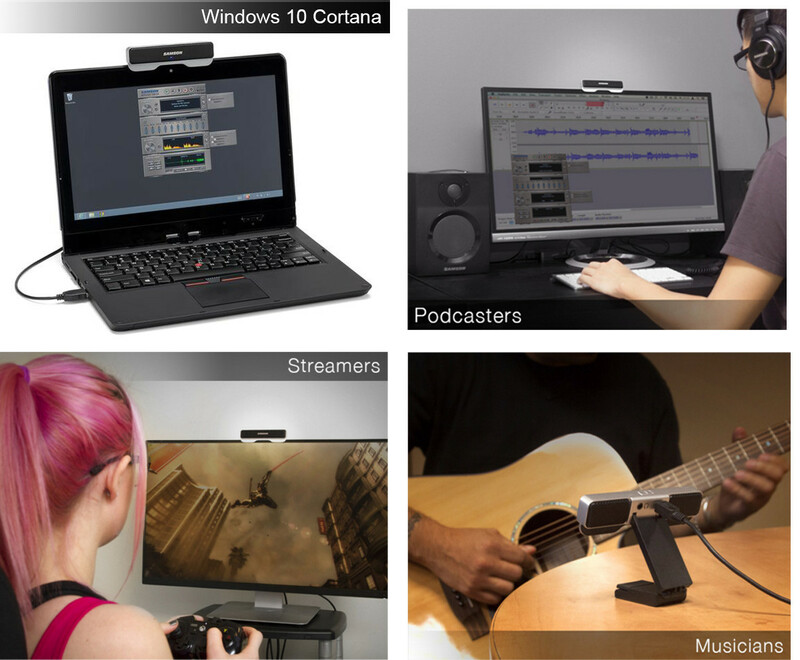 Continuous and repetitive noise is effectively removed from the microphone input, providing cleaner audio for speech recognition, videoconferencing, gaming, and voice over internet communications. Benefits of the Andrea digital audio enhancement software over other USB Microphones in the market. 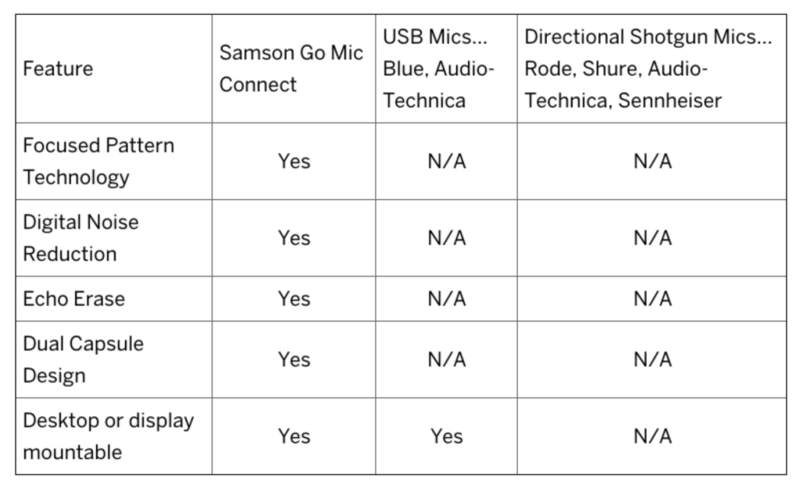 As you can see by this comparison chart, although there are several high-quality USB microphones on the market today, essentially none posses the digital audio filter capabilities of the Samson Go Mic Connect. 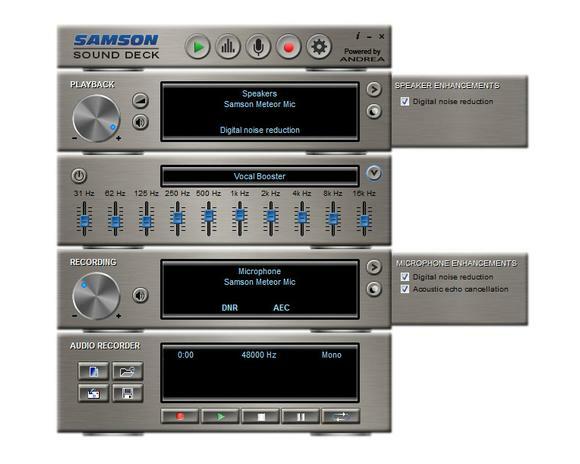 Click here to purchase the Sound Deck audio enhancement software for your Samson USB microphone.